Many years ago NASCAR racing caused some of the hottest performing V8s to be dropped into muscle cars while also fueling the release of the most aerodynamic automotive shapes of the original muscle car era. The 1969 Dodge Charger Daytona, 1970 Plymouth Superbird, and 1969 Ford Torino Talladega are the most famous examples of these shapes. NASCAR was also responsible for the production of some of the most sleek and aerodynamic American performance cars of the 1980s. Without NASCAR insisting that its drivers use race cars that had factory stock exterior body styling, we would have never seen the likes of the 1983-1988 Chevrolet Monte Carlo SS and 1983-1988 Ford Thunderbird – both of which were styled for the purpose of winning on the NASCAR racing circuit. The 2-door rear-wheel drive GM G-body platform served as the basis for most of GM’s NASCAR offerings during the 1980s. The 1980s 2-door G-body was the grandchild of GM’s 2-door A-body platform which many of GM’s legendary 1960s and early-1970s muscle cars (the Buick GS, Chevrolet Chevelle SS, Oldsmobile 442, and Pontiac GTO) used. By 1982 the 2-door rear-wheel drive A-body was gone, and the 2-door rear-wheel drive G-body was its official replacement. By the 1980s muscle cars were seeing a big resurgence and the 2-door GM G-body was just the platform to fuel this comeback. Since the G-body was rear-wheel drive and could accommodate a V8 engine it was a marriage made in Heaven. Buick with its G-body based Regal T-Type and Grand National deviated from this formula by using a turbo 3.8 liter V6. The G-body based Chevrolet Monte Carlo SS went with a high output 5.0 liter (305 CID) V8. Oldsmobile started out with the 1983-1984 Hurst/Olds which was replaced by the 1985-1987 Oldsmobile 442 – all of these were powered by Oldsmobile’s 170-180 horsepower high output 5.0 liter (307 CID) V8. It was like the height of the original muscle car era all over again inside the walls of GM with Buick, Chevrolet, and Oldsmobile duking it out for G-body performance supremacy. Unfortunately Pontiac which had officially started the original muscle car era with the 1964 GTO didn’t have a performance 2-door G-body to do battle with its GM cousins. Pontiac’s G-body Grand Prix may have been sporty along with luxurious depending on how equipped, yet it didn’t have a performance motor. It is unknown why Pontiac which during the 1980s had the Trans Am as its flagship performance car and offered performance versions of its 2-seat Fiero chose to ignore the Grand Prix. The Grand Prix came standard with Buick’s underpowered 2-bbl 3.8 liter V6 and optional with Chevrolet’s LG4 4-bbl 5.0 liter (305 CID) V8. Fortunately the Oldsmobile 5.7 liter diesel V8 option was eliminated by the 1986 model year as a Grand Prix engine option. Fast forward to 1986, the Monte Carlo SS was mandatory with Chevrolet’s 180 horsepower L69 4-bbl 5.0 liter H.O. (305 CID) V8. Worthy of note, the same engine in the 1986 Camaro Z28/Iroc-Z and Trans Am produced 190 horsepower. Since Pontiac was using Chevrolet’s LG4 5.0 liter V8 as an engine option on the 1986 Grand Prix, it would have seemed logical that Pontiac should have been able to have access to the more powerful L69 for its Grand Prix. Unfortunately that was not the case. 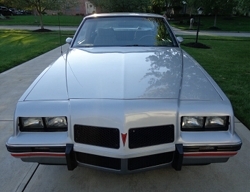 Pontiac had its last produced in-house V8, the 4.9 liter (301 CID) V8 forced out of production at the end of the 1981 model year. GM’s corporate motors policy began in 1982 where each division would produce motors for GM’s different divisions. It seemed like a great idea to save money, unfortunately it left Pontiac begging Chevrolet for performance motors. GM had tasked Pontiac with producing the Iron Duke 2.5 liter 4-cylinder for many different GM cars. Pontiac didn’t produce a V6 or a V8, so it had to get them from other divisions. Buick which was tasked with producing the 3.8 liter V6 for the different GM divisions also didn’t have an in-house V8, so they went the turbo route with their 3.8 liter V6 for its performance-oriented cars. 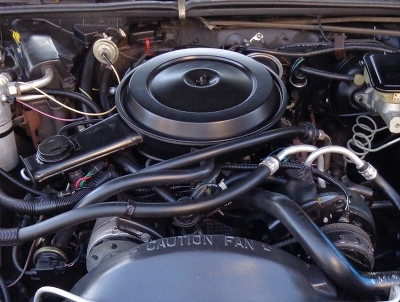 By 1986 Buick’s flagship performance car was the Grand National equipped with a turbo SFI 3.8 liter V6 which had an advertised horsepower rating of 235 but really produced around 300 horsepower. Oldsmobile for its performance flagship, the 1986 442, used its in-house 180 horsepower 4-bbl 5.0 liter (307 CID) High Output V8. So you can easily see how a 150 horsepower LG4 5.0 liter V8 powered 1986 Grand Prix was seriously lacking in performance by comparison. 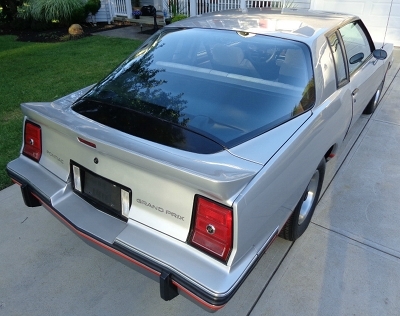 Pontiac decided to give a limited edition version of its 1986 Grand Prix a new aerodynamic front-end facelift, a black lower front air dam, add a really large curved fastback bubble behind the rear seats, and slap on a decent sized decklid spoiler. The net affect was a drag coefficient reduction from .45 down to .36 which brought its overall aerodynamics fairly close to Pontiac’s 1986 Firebird. These same aerodynamic improvements would be used with much success on the NASCAR Grand Prix race cars. Ironically Richard Petty who made history with piloting the ultra-aerodynamic 1970 Plymouth Superbird would also drive a very sleek 1986 Pontiac Grand Prix with all the aerodynamic advancements listed above on the NASCAR circuit. The production version of this aero Grand Prix would be called the Pontiac 2+2. The “2+2” name was a revival of Pontiac’s full-size 2-door performance car from the 1960s. 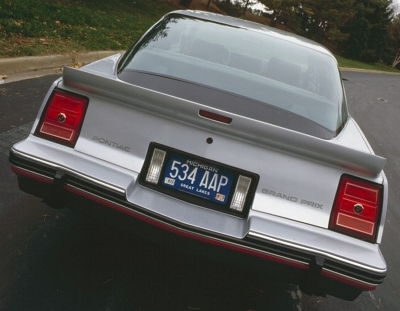 The 1986 Pontiac 2+2 looked the part, it made the aging Grand Prix styling look fresh and up-to-date. The downside was only 1,225 were produced so it wasn’t easy to get one. Even today they are hard to find. Additionally if you didn’t like the silver exterior color (lower part of the car was painted gray) you were out of luck. All 2+2 coupes had an attractive two-tone red lower stripe that separated the silver from gray color color schemes. All the Grand Prix’s flashy chrome had been replaced with black trim except for a little chrome around the front and rear black bumper strips. Even the Grand Prix’s hood ornament was gone and replaced with a Pontiac arrow decal between the two upper front grilles. The 2+2 also had twin black bumperettes in the front and back. Aesthetically the 2+2 coupe was everything Pontiac muscle car fans wanted. When it came to functionality, that was a different story. Due to the large glass bubble fastback the trunk was almost unusable. 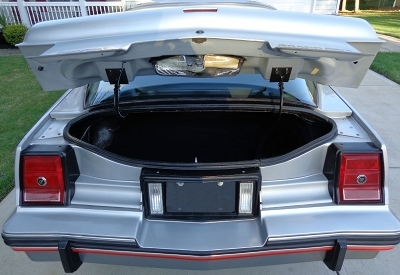 The Grand Prix’s large trunk didn’t shrink in size, the problem was the truck lid shrunk to such a small size. It was just big enough to slide the spare tire in and out with some fancy maneuvering. It was a small price to pay for owning a slick NASCAR inspired street car. The Grand Prix was stuck with 14-inch wheels, which made the 2+2’s standard silver with black accents 15×7-inch Rally II wheels with trim rings, a nice treat. 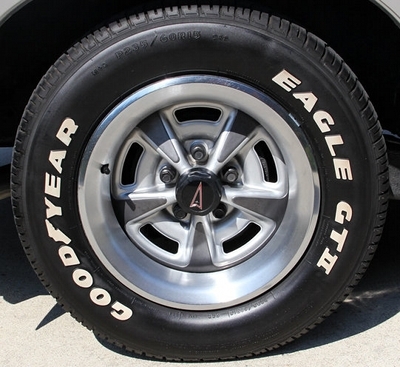 The wheels had sticky P215-65R15 Goodyear Eagle GT performance tires. For the dated G-body the 2+2 managed .77 g on the skidpad as tested by Car and Driver magazine (back in 1986) when it pitted the 2+2 against a 1986 Chevrolet Monte Carlo SS Aerocoupe (which had a new glass fastback which was smaller than the 2+2s). The 2+2 beat the Monte Carlo SS which during the same test only managed .75 g on the same skidpad test. The 2+2’s 4-wheel coil suspension had front and rear anti-roll bars allowing it to carve up the turns with relative ease. The downside was the 2+2 just like all the other performance rear-wheel drive G-bodies was stuck with rear drum brakes. Never-the-less the 2+2 stopped during the Car and Driver test in a reasonable 215 feet from 70-0 mph, the Monte Carlo SS took 211 feet to complete the same stop. The 2+2’s heavier curb weight of 3,626 lbs versus Monte Carlo SS’s 3,522 lbs was more than likely the culprit for the difference in stopping distance. Steering feel was identical between the 2+2 and the Monte Carlo SS – both cars had a power assisted recirculating ball steering which had a tight turning radius of 37.1 feet. The 2+2 and Monte Carlo SS were fairly evenly matched except when it came to acceleration – it was like a beauty contest matchup between Scarlett Johansson and Amy Schumer. The Monte Carlos SS in Car and Driver’s comparison annihilated the 2+2. The poor little 2+2 never stood a chance with its mandatory LG4 5.0 liter V8. Pontiac to its credit tried to make the best of the situation by have a free-flow dual outlet exhaust system and tuning the LG4 so its output was 165 horsepower versus the 150 horsepower of the regular Grand Prix’s LG4. But that’s the full story, it gets more interesting. The 2+2 that magazine staff test drove back in 1986 had the factory dual exhaust system but the production version had the Grand Prix’s single exhaust. The dual outlet exhaust system was good for at least 5 extra horsepower. High Performance Pontiac magazine years ago speculated the production 2+2’s true horsepower output was 157 horsepower with the single exhaust system. Some have speculated the 2+2 had the same 150 horsepower output as the 1986 Grand Prix’s LG4. Interesting to note the LG4 equipped 1986 Chevrolet Caprice which also had single exhaust had a factory horsepower rating of 165. So it is possible that the 2+2 did have 165 horsepower. Pontiac officially rated the production 2+2 at 165 horsepower and 245 lb-ft of torque so that is how history will see the 2+2’s horsepower output as despite all the speculating. It really doesn’t matter what the 2+2’s true horsepower output was since its LG4 was no match for Monte Carlo’s brawnier (180 horsepower) L69 5.0 liter V8. The 2+2 took 10.2 seconds to hit 0-60 mph and 17.6 seconds to finish the 1/4 mile run while the Monte Carlo SS went 0-60 mph in 9 seconds and the 1/4 mile in 16.8 seconds (according to Car and Driver). Not helping matters was the 2+2’s 3.08 ratio limited slip rear axle versus the more performance oriented Monte Carlo SS’s 3.73 ratio limited slip rear axle. When compared to most 1986 cars, the 2+2 had good performance – most cars during this era took longer than 10 seconds to reach 0-60 mph so with that frame of reference the 2+2 could be considered a performance car. Worth noting, High Performance Pontiac magazine (October 1986 issue) was able to obtain a 0-60 mph time of 9.2 seconds and a 1/4 mile time of 17.1 seconds with a factory stock 1986 2+2 which showed maybe the 2+2 had more potential than the Car and Driver test suggested. Had the 2+2 had a manual transmission option the 2+2 would have been slightly quicker. The 2+2 just like the 1986 Monte Carlo SS could only be equipped with a 4-speed automatic transmission. None of this really matter because when the 1,225 2+2 arrived at Pontiac dealers they sold extremely quickly even though they were expensive. The 2+2 in Car and Driver’s test had a sticker price of $18,214 which was about $2K more than the comparably equipped ($16,325) Monte Carlo SS Aerocoupe (which was more expensive than a regular Monte Carlo SS) in the same test. And it should be noted that some of these sold with dealer markups considerably higher than sticker price. For Pontiac fans who also were NASCAR fans, the 2+2 was a must have car. The 2+2 may have looked like a million bucks when viewing the exterior. The interior was another matter. It was loaded with a lot of options but the seats and door trim panels were base level Grand Prix. For instance the mandatory gray cloth seats had gray vinyl sides, and the same was true for the interior door panels they were a combination of cloth and vinyl. The front bucket seats were flat with virtually no contours. It was the type of interior you would have expected in a base-level car. 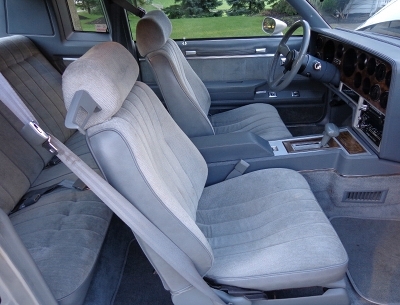 It’s understandable why Pontiac wouldn’t have used the Grand Prix Brougham’s ultra plush velour cloth interior since the seats were too pillowy to be performance oriented but the Grand Prix LE had nice optional all cloth sporty bucket seats which were similar to the ones found in the Trans Am. Additionally the LE had only cloth on the interior door panels. The SE interior was much sporty and would have been a much better fit in the 2+2. Only conclusion one can make is Pontiac was trying to maximize its profits by offering the bare bone base level Grand Prix interior in the 2+2. Fortunately the 2+2 was standard with the Trans Am’s sporty leather wrapped steering wheel. Another deficiency of the 2+2 was the lack of the removable t-top roof panels option. This was one of the big appeals of the rear-wheel drive 2-door G-body, not having this option on one of the most rare G-bodies was a real shame. Two of the key benchmarks of collectable cars are exclusivity and speciality. The 2+2 has them both, it was one of the rarest rear-wheel drive muscle cars of the 1980s. Ironically the 2+2 has an air of rarity which leaves most thinking it is more exclusive than the 1986 Monte Carlo SS Aerocoupe. This is not the case since only 200 Aerocoupes were produced for 1986. The reason is that the Aerocoupe returned for 1987 and was produced in my higher numbers (6,052 units) while the 2+2 never returned for 1987. The 2+2 was Pontiac’s last 2-door rear-wheel drive muscle car that could trace its roots back to the original A-body GTO. Even today it is a special car that not only will provide any car collector an excellent long term investment but is an excellent example of the last of the production speciality cars built for the main purpose of winning on the NASCAR racing circuit.